As the final Ice Age came to a close around 12,000 years ago, the earth underwent dramatic changes that permanently affected flora and fauna on a global scale. Warmer temperatures caused massive glaciers that once covered a fourth of the planet to melt, raising ocean levels. Both wildlife and humans migrated north to now temperate regions once barely inhabitable due to the extreme cold. 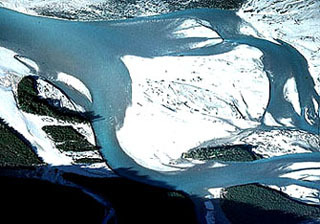 Wide open plains were transformed into dense forests by the new-found moisture released by the melting glaciers. By now, about 25,000 years have passed since the last Neanderthal. Modern man (Homo sapiens sapiens) has been the sole human species in existence since this time. The effects of the end of the Ice Age also brought about changes in the behavior of man. No longer was it easy to track and hunt large herds that once graced the plains. The thick forests that replaced these regions now proved a difficult and less bountiful arena for taking wild game which provided so many resources to their daily lives. Important wild plant food sources also disappeared or were replaced with different and less desirable types. The "Hunter/Gatherer" was now looking to a new role - one of agriculture and animal husbandry. In the entire history of human development, this event was the single, most important change in man's history. It is this milestone that now allowed humans to feed much larger populations thereby enabling communities and later, cities to emerge. SOCIETY was now replacing SURVIVAL! The NEOLITHIC AGE (New Stone Age) is identified with the advent of crop cultivation and domestication of animals. No longer must humans rely on the constant search for food and can now permanently reside in the same area, abundantly providing for themselves on farms. Ceramic pottery first arrives on the scene, serving as a storage vessel for this newfound abundance. At this time, man is still relying on stone as the sole material for tools and weapons. This usage continued until various time periods in history based on geography and even well into the Copper and Bronze Ages around 3000 years ago. This was especially the case in regions such as Northeastern Europe where metal was scarce and some of the finest flint was readily available and mined extensively. The most fascinating example of this is in the Danish Neolithic weapons of around 4500 years ago. These daggers and axe heads were meticulously ground and knapped out of stone and were masterpieces made to exactly resemble copper originals made by nearby metal-working societies. 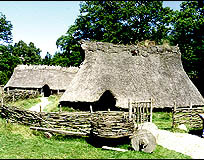 Excavations of farming villages indicate a once peaceful and prosperous life. In later times though, scientists have found these villages evolved into forts surrounded by protective moats. The proliferation of stone weapons is especially noted in these later period layers. Could the competition for more fertile lands and pastures brought about by the now fast growing populations have led to this marked increase in violence?